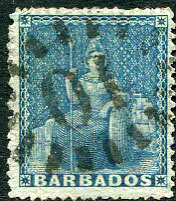 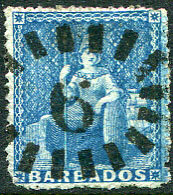 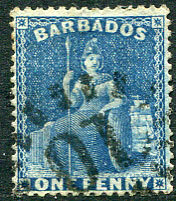 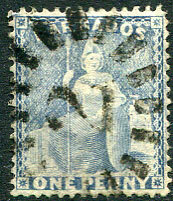 (C2) bootheel on 1874 1d deep blue (SG.66). 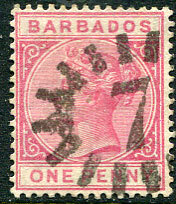 (M2-R) dated 8/OC 17 83 on QV 1d (SG.91), scarcest code of the Parish Type M2 group. 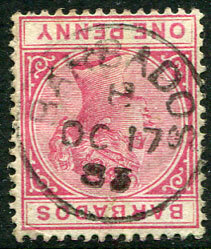 (C2) bootheel on QV 1d (SG.92). 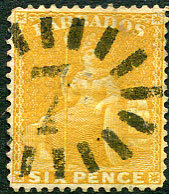 (C2) bootheel on 1876 6d chrome-yellow (SG.79). 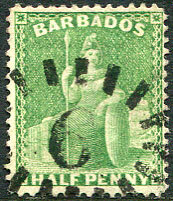 (C2) bootheel on 1876 ½d bright green CC wmk P.14 (SG.72). 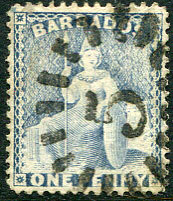 (C2) bootheel on 1861-70 (1d) deep blue No wmk (SG.24), light diagonal crease. 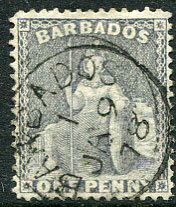 (C2) bootheel on QV 4d grey (SG.97). 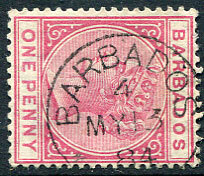 (M3) dated 7/DE 14 87 on QV 1d (SG.91). 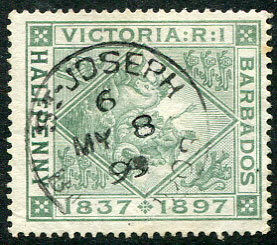 (M2-R) dated 4/JY 20 86 on QV ½d (SG.90). 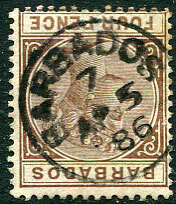 (M2-R) dated 7/AP 5 86 on QV 4d (SG.99). 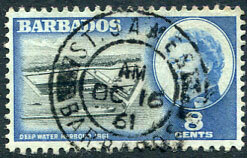 The seldom seen 21mm cds dated I/JA 9 78 on 1d grey-blue (SG.74). 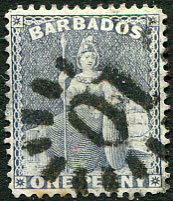 Unlike the E2 with lettering set close to rim this cds is larger and lettering is set further away from rim. 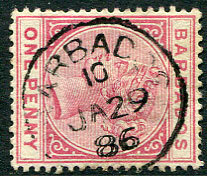 (M3) 7/AP 16 89 on QV 2½d (SG.94). 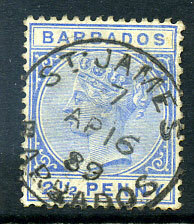 dated */JA 5 99 on 8d Diamond Jubilee (SG.122). 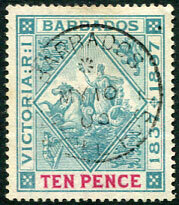 dated */MY 10 00 on 10d Diamond Jubilee (SG.123, Cat.£55.00). 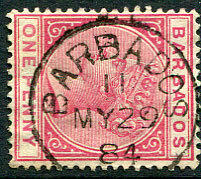 (M2, close to outer rim) on small star (1d) 2/MR 24 73 (inward tear, crease) plus 2/JA 27 88 on 1d reversed CC wmk. 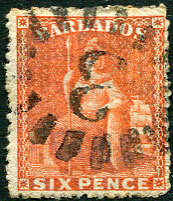 (M3) JY 5 90 on QV ½d (SG.90), some creasing. 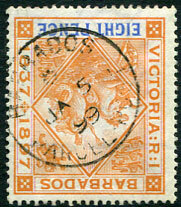 (M2-R) dated 11/MY 29 84 on QV 1d (SG.92). 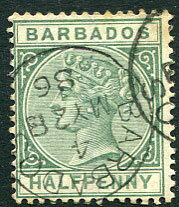 (M2-R) dated 10/JA 29 86 on QV 1d (SG.91). 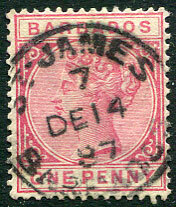 (M3) dated 6/MY 8 99 on ½d D. Jubilee (SG.117). 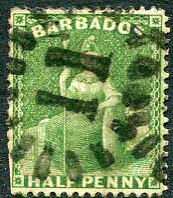 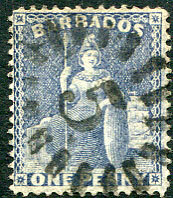 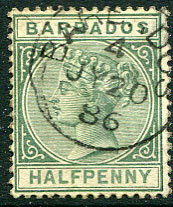 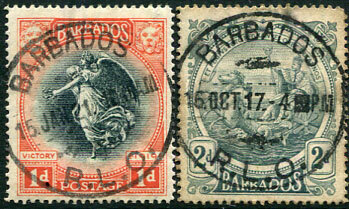 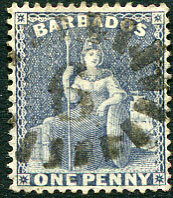 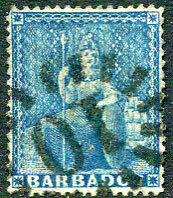 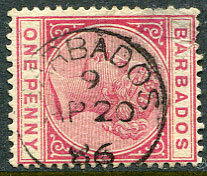 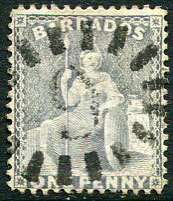 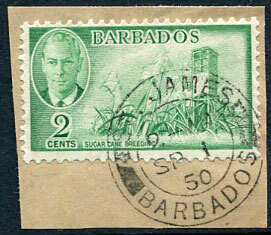 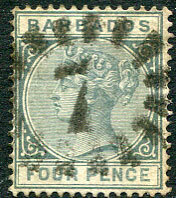 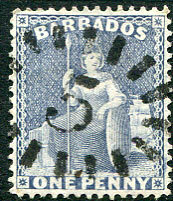 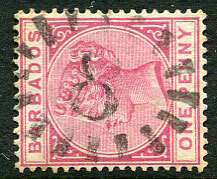 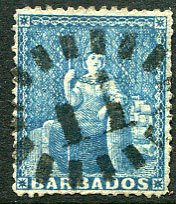 (M2-R) dated 4/MY 28 86 on QV ½d (SG.90), minor toning. 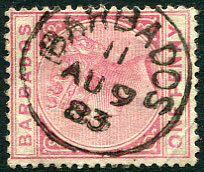 (M2-R) dated 11/AU 9 83 (currently second earliest date any of the Parishes) on QV 1d (SG.91), corner crease. 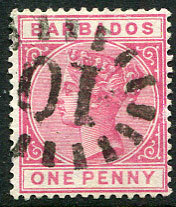 (D/R) OC 16 61 on QE2 8c (SG.295). 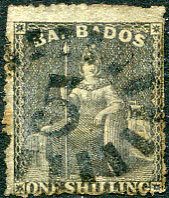 (M4) 17 FEB 27 on 3d Seal (SG.234), crease. 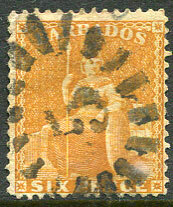 (D/R) SP 1 50 on KG6 2c (SG.272) piece. 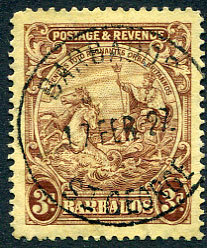 (M2-R) dated 4/MY 13 84 on QV 1d (SG.91). 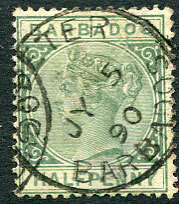 (M2-O) dated 9/AP 20 86 on QV 1d (SG.91), defective with badly thinned corner. 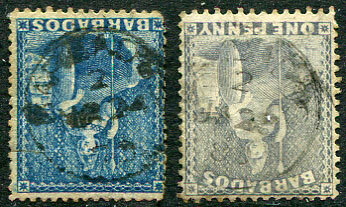 Britannia design Differing postmarks Farthing stamps K.N.S.M.